Eyeliner can solve many problems. It will visually lift overhanging eyelid, emphasize beautiful cut and will create the effect of thicker and darker eyelashes. But in any way, and makeup eyeliner should be done carefully. Learn to paint eyes is easy – it will require just a few lessons. Get everything you need for makeup. The beginner is better to try to draw eyes with a soft pencil – it goes on more smoothly, and if the line will look messy, it is easy to correct. The ships require more experienced hands. It is most difficult to apply liquid eyeliner to give you a clear arrow showing the slightest error pattern. Use only high-quality products with no expiration date. A dry marker or a hard, scratching the eyelid pencil will never give you smooth lines. It happens that beautiful at first glance, the eyeliner dries, lies unkempt pieces, loses its luster and flaking. Do not use it – you got bad copy. Look for products of a different brand. Those who only tries the forces in the art of drawing arrows, it is better to apply eyeliner before you put the shadow on the eyelids. Then, in the case of failure, you will not have to remove all the makeup. After the shadows line can be refreshed with another layer of eyeliner, giving her a clearer path. Before makeup, clean eyelids, wiping them with toner without alcohol, and whisk in a little light moisturizer. If you have oily skin, apply a thin layer of the base, preventing the spreading of makeup. Lightly powder the eyelid and start applying. Take a soft pencil and, holding it at an angle to the eye, keep the line since mid-century. It can slightly extend outside the contour, extending the incision. 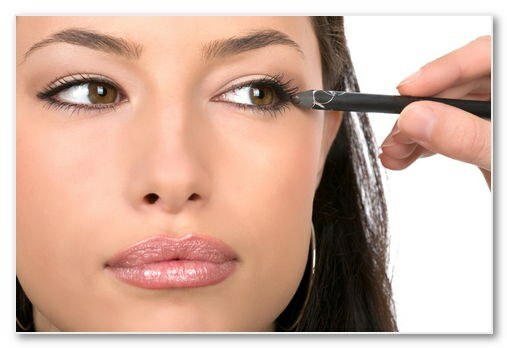 The thickness and intensity of the liner can be adjusted by pressing the pencil. Lightly blend the arrow, making it softer. You can now apply on the lashes layer a lengthening mascara, and light day make-up ready. To makeup was more vivid, move the arrow from the inner corner of the eye. After applying blend it with a damp applicator, it will give the color saturation and depth. On top of the pencil you can put a thin line of liquid eyeliner. Means in the form of a cream or gel applied with a special brush with a beveled edge. Dial a bit of eyeliner and keep the edge of the brush on eyelid, keeping as close as possible to your lash line. Follow the arrows symmetry, both eyes should look the same. If you need a thin and clear line, use liquid eyeliner. Sometimes this tool is not a very good brush – it can be replaced by more convenient purchased separately. If the line turned out uneven, adjust it until it dried. Mash the arrow end of the applicator - it will be a little wider, but it will look neater. Eyeliner can adjust the shape of the eye. The broad line will make more of them, and the arrow in the outer area, a raised to his head, hand lift the drooping eyelid.